Home » Events » Above Board Chamber Panel of Experts to Explore “What is the Value of Your Business? Above Board Chamber Panel of Experts to Explore “What is the Value of Your Business? Above Board Chamber of Florida is proud to present an expert panel discussion on “What is the Value of Your Business?” on Thursday, June 12 from 11:30 a.m. to 1 p.m. at the Landings, 4540 S. Landings Drive, Fort Myers. The panelists will include: Dan Regelski Director of the Small Business Development Center (SBDC); Susan Moyer, President at Cadeau & Company, Inc.; and Bonnie H. Bolton, Area Manager for JP Morgan Chase Bank, with others to be announced. Steve McQuilkin, Business and Education Editor at The News-Press, will emcee. Registration on or before June 9 will be $22 for members and $28 for friends. After June 9, registration will be $28 for members, $32 friends. Non-profits can put up a free table, and members can put up a table for $25. Attendees must RSVP. To register, visit www.aboveboardchamber.com. Business owners need to know the value of their business and how to build value for three reasons: 1. Divestiture (selling) of your most valuable asset – your business, 2. re-capitalization (cash infusion) for growth of your exiting entity, 3. credit facility (private or institution) for growth or refreshing a credit line. Join us in June and learn from some of the best experts in the area how to increase the value of your Business! This event is expected to fill up fast, so be sure to secure your RSVP today! Leslea Ellis, LLC is the event sponsor. For more information on the event or on how to become a member of the Above Board Chamber, contact Jeanne Sweeney at 239.910.7426. 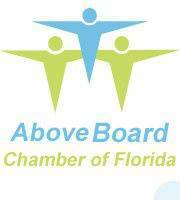 The Above Board Chamber will hold its Naples meeting on the same topic on Monday, June 9 at the Naples Hilton.